Quick *Spoiler alert* Season 1 ended with Villanelle hospitalised after a fight with Eve and now in the new season...she's alive and out for vengeance. It's hard to sum up the tension of this new season but any fans of the first season will be hooked by where the show has gone. Watch Killing Eve online: when's it on? The second season of Killing Eve made its return to US television on Sunday, April 7. Episodes will air every Sunday meaning the next one is on April 14. Considering the first episode of this season was the most watched episode yet and episodes two and three received heavy amounts of praise, you know it is worth tuning in for. Now with the fourth episode shaping up to be a game changer, now is the time to watch Killing Eve online. The deadly game continues, so find out how to catch up on the first three episodes and see where to watch the rest of Killing Eve season 2 in the US or, if your holiday and the launch overlap, how to watch Killing Eve online from abroad. If you're planning on watching Killing Eve in the US it's easy! You simply need to have access to cable and a connection to a BBC America broadcast. You can also watch the show online via the internet if that's how you're planning on binging. This is possible live using the BBC America app or by going straight to BBC America as long as you have a log-in and a cable subscription. And if you've badly timed a holiday or just so happen to be out of the US while it is airing live but still want to watch Killing Eve online as each episode comes out, then there's another way. A slightly more complicated system to watch the show live involves the use of a VPN, you can find out more below. 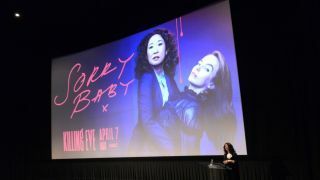 Sorry UK fans...when it comes to Killing Eve, the US and Australia gets first dibs on viewing. An official date for the UK airing of the show has yet to be announced but sadly, we're going to guess it won't be until around September this year. It aired in the US in April last year, followed by a September date for the UK so we can only assume the same will happen now. But if you can't wait that long and you need your Killing Eve fix then you can watch all the eight episodes of season 1 still on BBC iPlayer, not the same as the new episodes but it should hold you over.